So, you're interested in recreational vehicles - or RV campers for short. Maybe you want to try camping for the first time and you know that you are just not a tent person. Or maybe you have been tenting for long enough to know that you love camping - and now you're ready to upgrade to something more comfortable. 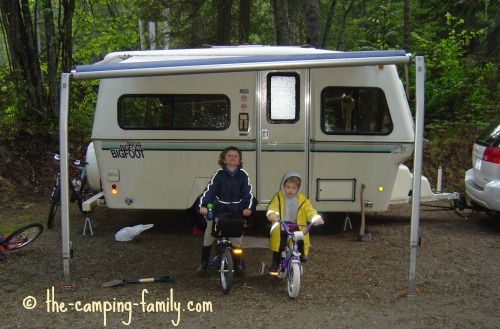 Owning a recreational vehicle makes family camping easy. You can keep your camper packed and stocked all season. When you're ready to go camping, all you have to do is make a food plan, check your camping list, and go! 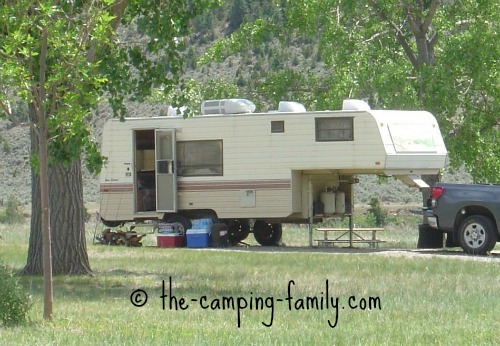 There are so many types of RV campers! Read on to learn which is the perfect choice for your family. These are the smallest of all towable RVs. These are too small for most families, but they are awfully cute! Click here to learn more about teardrop trailers. Truck campers mount on the back of a pickup truck. They range from small cozy units to large models complete with full bathroom and kitchen! 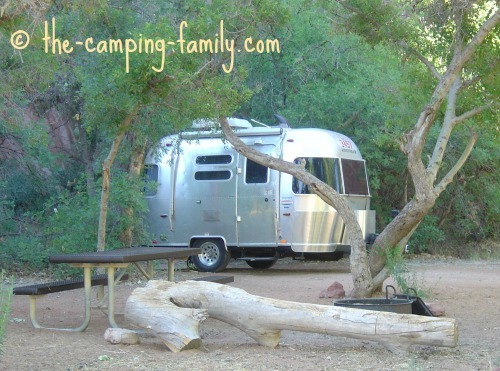 Click here to learn more about truck campers. 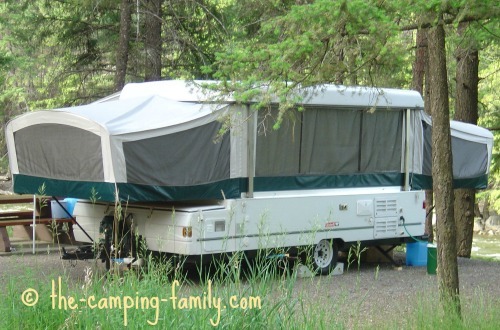 Tent trailers are a lightweight and relatively inexpensive RV option. Many tent trailers can be towed by a car or van. Today's tent trailers are comfortable and well-equipped. Click here to learn more about pop up tent trailers. Travel trailers are towed behind a good-sized vehicle. They vary widely in size and price - all the way from tiny basic units to 40 foot luxury models. 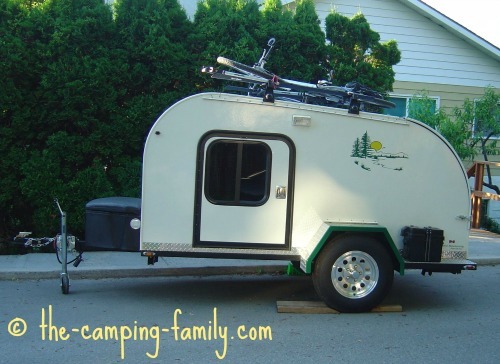 A hybrid is a travel trailer with fold-out bunks. It has the advantages - and some of the disadvantages - of both a standard travel trailer and a tent trailer. Click here to learn more about hybrid travel trailers. 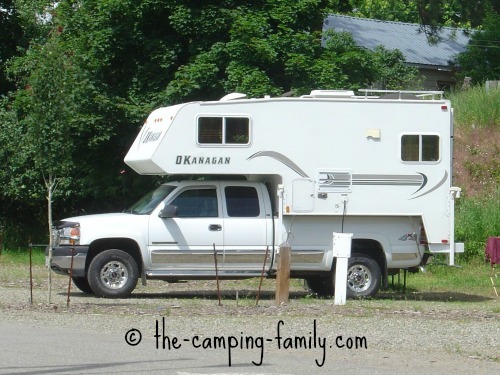 A fifth wheel RV is towed by a pick-up truck equipped with a special hitch. Those who know say that a fifth wheel trailer is easier to tow and easier to hitch than a comparably-sized travel trailer. A motorhome is a motorized RV. If you know that hitching and unhitching a trailer is not for you, a motorhome might be a good option. Click here to learn more about small motorhomes. 1. Do you have a pickup truck, or are you willing to buy one? If not, you can cross truck camper and fifth wheel off your list. 2. 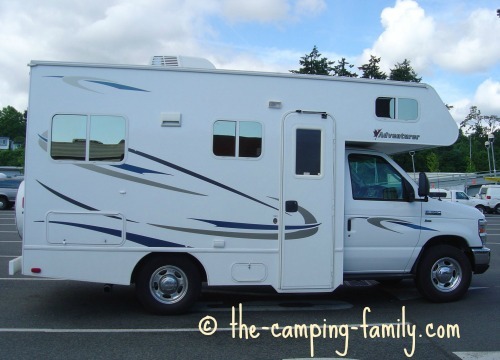 Do you want to be able to separate the RV from your vehicle? 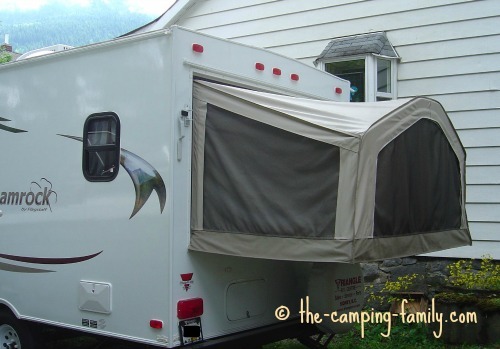 If you plan to leave the RV in the campground while you use your vehicle to do errands or go exploring, you probably won't want a truck camper. It is possible to remove your truck camper from the pickup truck, but that's quite a bit of hassle. You won't want a motorhome either - unless you are prepared to tow an extra vehicle behind it. 3. How many people will be staying in the RV? How many beds will you need? Can some people sleep in tents? 4. 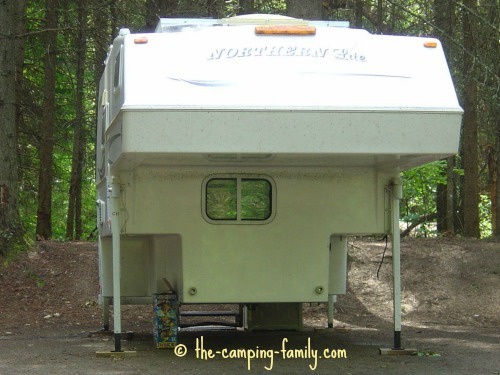 How much set-up at the campground are you prepared to do? A small motorhome requires very little set-up. A tent trailer requires quite a bit. Small budget? 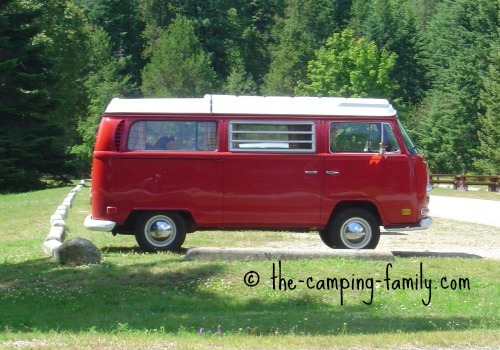 Look for a tent camper, or a small travel trailer, or a little camper van. Consider buying a used RV. Large budget - or no budget? The possibilities are endless! 6. What about fuel economy? 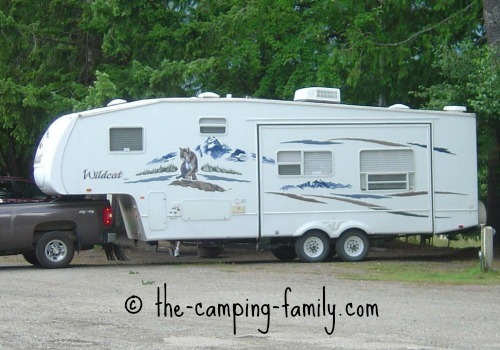 Of course, the smaller the RV, the less it will cost to move it around. Once you have a general idea of your needs, you are ready to start looking. Here's how to begin. You'll see all of the current models. Even if you have no intention of buying a new RV, you'll learn a lot by touring the models and talking to dealers. Walk around the lots. Go in the RVs. Try to imagine your family spending a weekend in each unit. Spending a weekend camping in an RV will help you ensure that this type of camping is for you - before you invest a lot of money! We started out camping in a tent. That was great, but when we had children I wanted to be warm and dry no matter what the weather. We bought a used 19 foot Bigfoot travel trailer. We loved it, but the beds were too small for two adults to sleep together. 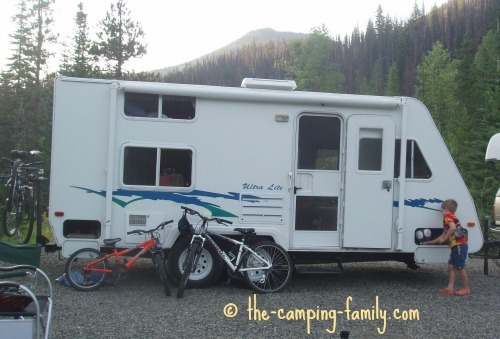 After a couple of years, we upgraded to a used 21 foot Okanagan Ultralight travel trailer. The beds were comfy, we had a good-sized fridge, and there was room for us all at the dining table. There was lots of storage space, and a full bathroom. Now that the boys are bigger, we are doing mostly backpacking, canoe camping and boat camping. We are a tenting family once again! Keep in mind that your needs will change as your family grows. Do your research, investigate lots of RV campers, and make the best choice for your family at this time. May you have many wonderful trips and make many wonderful memories while camping in your RV! 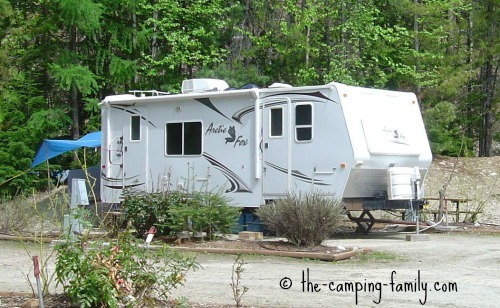 Now that you have an idea about the various types of RV campers, go to The Camping Family home page for information about every aspect of your next camping trip.